Originally developed by Param for the Nintendo 64DD, Doshin the Giant is a God simulation game. 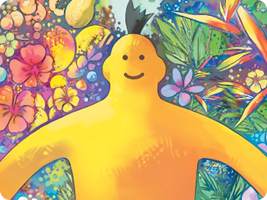 You control the yellow giant Doshin as he aims to please the villagers on his island... or transform into the Hate Giant Jashin and cause destruction and mayhem. Whichever path you take, you will grow larger, helping you to flatten the land so your villages can thrive.